Even though the weather has warmed up a bit, many women will still choose to do protective hairstyles in order to give their hair a break from frequent manipulation and from the elements. Protective styles are not only for the cold weather, they can also be done in the warmer season to protect the hair from the sun's UV rays, humidity, strong wind, and from the scorching summer heat. Summer time is also a season when many people will fill up their schedules with outdoor activities and many other festivities. This means that a lot of women will be busier in the summertime than in any other season. And as a result, they might not have enough time to spend styling their hair as often as they’d like to. Here are 10 ways that you can retain as much length as possible from a protective style. 1. Make sure you fully detangle your hair before you go get it done. This way, you won't have to worry about the stylist combing your hair while it's dry. Detangling your hair prior to installing a protective style helps to speed up the styling process and it reduces excessive breakage which can happen when the hair is manipulated in its dry state. 2. Be patient and gentle when you or your stylist is installing the protective style. ...so that you don’t end up with split ends which can reduce the amount of length that you retain. 3. Remind the stylist to not pull too tightly on your scalp. Tight hairstyles are not only painful and uncomfortable, they can also be damaging to the hair follicles. This can affect your hair growth potential and result in bald patches around your edges and in different sections of the scalp. 4. 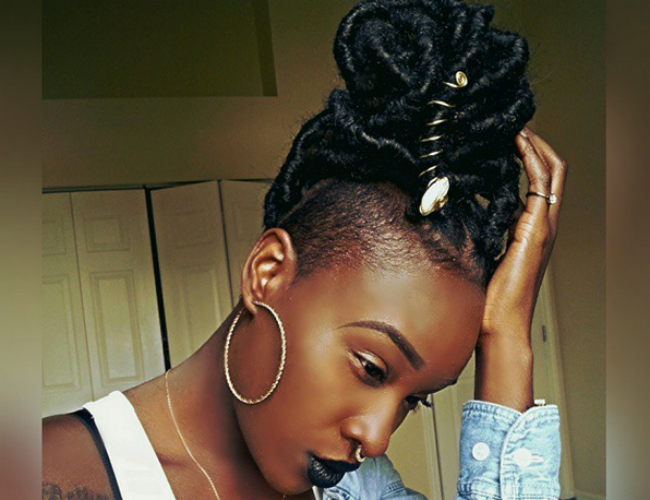 Avoid over-manipulation during the time that you have your protective style in. Frequent styling and restyling can cause frizz, which can shorten the intended length of time that your hair is supposed to be kept in a protective style for. 5. To moisturize your hair, combine water, oil and leave-in conditioner in a spray bottle. Then, lightly spritz your hair a few times in a week or as needed. Spritzing your hair often with a hair spritz helps to re-hydrate the hair without disturbing or roughening the hairstyle. This allows you to wear the hairstyle for a longer period of time. 6. When going to bed, wear a silk head wrap to help keep your style in place while you sleep. An ordinary bonnet will still protect the hair, but it won’t hold the hair in place like a scarf would. Silk scarves also help to keep the hair smooth and minimize frizz while you sleep, so you won’t have to do much maintenance in the morning. However, if you’re an active sleeper, it’s best to secure the scarf by wearing a satin bonnet on top of the scarf. 7. To maintain your edges, use a soft toothbrush to gently brush up your baby hair when needed. 8. If you must change the look of your protective style, make sure to rub a few drops of oil on your palms before rubbing your hands in your hair. Lubricating your palms prior to restyling helps to reduce friction and frizz which can sometimes make the hairstyle to look rough. 9. When it’s time to take down the style, please make sure that you take your time and be very gentle with the process. Depending on the style, try to use your fingers to take down the style in order to minimize breakage. When detangling, make sure you only detangle small sections of the hair at a time, so that you don’t lose all your new growth to breakage. 10. After taking down your protective style, the next thing you want to do is a thorough deep conditioning treatment. Many protective styles doesn’t allow for a deep conditioning treatment because it can roughen the hairstyle. So the best way to restore moisture and strength back to the hair is to deep condition it when it’s loose. What other ways do you maximize your protective style?